The birthplace of Khokhloma is widely credited to be the town of Semyonov, in the Nizhni Novogorod region, a little over 300 miles northeast of Moscow. It is still one of the main producers of Khokhloma today. Legend has it that the craft was invented by a clandestine icon painter, who lived deep within the forests which surrounded the Kerzhenets River. The painter, a member of a group of “Old Believers” who inhabited the area, broke from the Russian Orthodox church in the middle of the 17th century. The painter learned of a band of men who were coming to forcefully bring him back to Moscow to answer for his dissension, the craftsman quickly gave away his brushes, and told the members of his village the secrets of the art of Khokhloma. 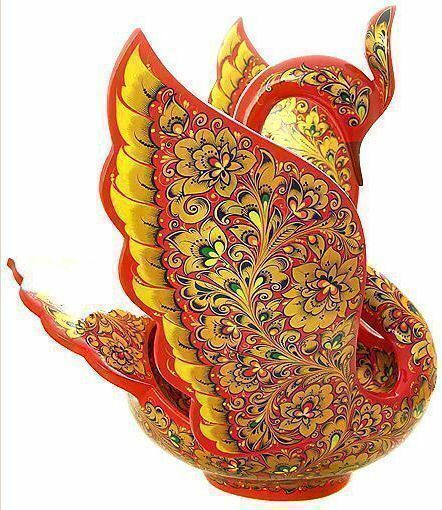 The legend then says that the man burned down his house, and was killed in the blaze, but throughout the night the red fire cast a golden aura against the black night sky, and no one would soon forget the colors associated with the art of Khokhloma. Whether or not the legend is true, the arduous creation process has been passed down from generation to generation, and despite changes in the tools, and materials, the method to create these beautiful pieces remains more or less the same. The process of crafting a piece of Khokhloma can take up to two years, depending on the size, and intricacy of the design. After the wood is prepared, and cut into the desired shape, the shaped pieces have dried in the kiln rooms, a thin layer of brown clay "primer" is applied by hand and they are kiln dried again. After three coats of oil are applied to the primed pieces and they are air dried, their slightly sticky surfaces are now ready for tinning. The distinctive gold color, which is the trademark of Khokhloma pieces, originally starts out as powdered aluminum (or in the past, powdered tin, or sometimes even silver) which is again heated in the kiln, after being decorated with heat resistant paint, and varnished. The extreme temperature turns the powdered aluminum a glistening golden color. After the shaped pieces have dried in the kiln rooms, a thin layer of brown clay "primer" is applied by hand and they are kiln dried again. After three coats of oil are applied to the primed pieces and they are air dried, their slightly sticky surfaces are now ready for tinning. Today powdered aluminum replaces the once used tin. With the tinning process finished, and the pieces kiln dried for a third time, these shiny, silvered works are ready for the artist's hand. The whole process is extremely individualistic and never are two pieces exactly the same. Both the themes, and the colors, mostly blacks, reds, greens, and gold, draw their inspiration from nature. The themes popular today have changed very little since the art was originally conceived in the 17th century, a testament the timelessness of the Khokhloma style. The method of creation yields not only a beautiful result, but one which is both practical, durable, and long lasting. 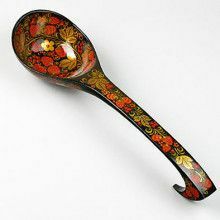 Khokhloma can be used for utilitarian purposes such as eating, and drinking, as well as display. It is also resistant not only to the acids from foods, but also the effects of nature; Khokhloma can be transported from arid climates, without risk of warping in the the wood, or cracks in the paint. Khokhloma folk craft is constantly growing and developing, while at the same time remaining true to its original roots and themes. Adopting the best traditions, one generation changes another, and using modern materials and paints, the art has become diverse, and its colors more vibrant and rich. It is not accidentally that Khokhloma art is so popular either in Russia or abroad. Khokhloma design can be seen gracing the tails of some British Airways Boeing 757s, it can be seen on the adorning the sides of world class race cars such as the Lada Kalina Super 1600, it can even be seen on t-shirts. New shapes and canvases waiting to be painted with a Khokhloma design are all around us, and we will be able to become the eye-witnesses for new applications, and uses for the timeless, instantly recognizable, and unique design.